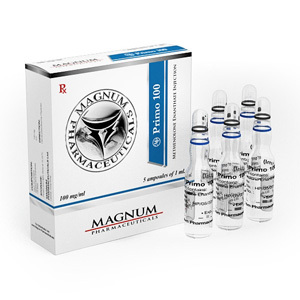 Magnum Primo 100mg/ml, many experienced athletes skillfully combine with steroids of strong androgenic action. In this case, its anabolic properties increase several times. Best of all, Magnum Primo 100 manifests itself in interaction with Oxandronolom. It is noteworthy that the described drug is used not only by men. It is quite common among women. But it is natural that the dosage for women will be less than for men. They, like men, can combine it with other drugs to achieve their goals. The recommended dosage without a combination with testosterone is 600-800 mg per week, however, if there is an opportunity to increase the dose to 1000 mg, the result will be much better. According to many athletes who use anabolic steroids, the optimal course of taking primobolan is 12 weeks. After a 12-week course of administration, this anabolic steroid is still being cleared and processed in the body for 5-6 weeks; therefore, its actual duration is quite long. The maximum duration of a course of Primo 100mg/ml is 20 weeks. This drug does not cause serious side effects. As a rule, it is accepted by athletes who carefully relate to their health. It does not affect cholesterol levels or blood pressure. The only thing is to carefully monitor your liver. In a certain period of time, it is even recommended to visit a doctor for examination of this organ. It is recommended to do this as a preventive measure in order to avoid undesirable consequences. All the drugs have a negative effect on the liver, because it does not mean that such an effect is a feature of Primobolan.